The most complete override locking system on an anti-ligature lockset, our 5-way Staff Override System (SOS) lockset provides five override methods to ensure you gain access. In the most common barricade scenario, the staff key dominates the internal turn/pull, ending the barricade quickly and simply. It also contains additional emergency override methods to overcome determined barricades. We hope you rarely use them, but when you do, they might just save a life. The lock and the internal turn/pull operate independently, so the key always dominates. It's a direct mechanical override, so there's no geared cylinder to disengage the turn/pull or clutch mechanism involved. Spindle shears under heavy resistance, ensuring entry if turn/pull is immobilised. So even in the most serious barricade attempts, where the service user attempts to jam the turn/pull with their bed or body, swift access is achieved without lockcase damage. 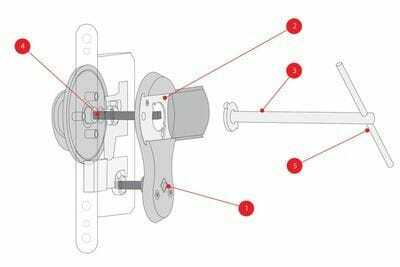 T-bar provides significant power advantage to pull the door open offering better grip than an anti-ligature handle and foiling attempts by a service user to hold the door shut.